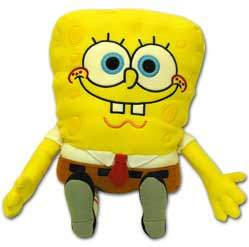 SpongeBob: Cuddle Pillow - 25"
Size (inches): 20.47" X 14.57" X 5.91"
This 25" SpongeBob Cuddle Pillow is sure to put a smile on any child's face! He's huggable, he's lovable and there's no mistaking that toothy grin and wide-eyed enthusiasm; he's the one and only, crazy Sponge Bob complete with detailed, quality stitching in those silly facial details, and two arms ready to wrap around some lucky little child! So strange, so unique, so...uh...spongy. Deep down in the Pacific Ocean in the subterranean city of Bikini Bottom lives a square yellow sea sponge named SpongeBob SquarePants. SpongeBob lives in a pineapple with his pet snail, Gary, loves his job as a fry cook at the Krusty Krab, and has a knack for getting into all kinds of trouble without really trying. When he's not getting on the nerves of his cranky next door neighbor Squidward, SpongeBob can usually be found smack in the middle of all sorts of strange situations with his best buddy, the simple yet lovable starfish, Patrick, or his thrill-seeking surfer-girl squirrel pal, Sandy Cheeks. In Bikini Bottom, fish walk, blowing bubbles is art, and the tastiest undersea snack is a deep-fried Krabby Patty Burger. Dive in and soak it all up with SpongeBob! More Photographs - SpongeBob: Cuddle Pillow - 25"
End of More Photographs - SpongeBob: Cuddle Pillow - 25"